If the Distortion Theory is correct , we should find groups of cases where mental stimulation, an exterior psychological (influence), is the same, having in common a symbol (archetype) very recognizable to many people. This "icon" can come from, inter alia, literature, film, television, and even the world of advertising. There are certain "images" that link to the human psyche, making them very popular and these are integrated into our mental universe. Hence, the "external agent" connecting (interacting) with the human psyche uses this "archetype" to "manufacture" experience. However, each person’s particular imagination is able to transform this determined stimulus, giving details and characteristics that are unique (non-transferable to other witnesses). A clear example of shared Distortion are the close encounters where the crew observed the UFO with the appearance of the famous Bibendum (the "Michelin Man"). ﻿France is one of the places with highest number of such cases. 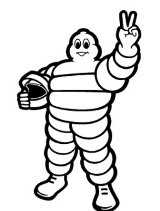 Remember that the Michelin tire company was created in France in 1889. The Bibendum character was designed in 1898 by cartoonist O'Galop, commissioned by the brothers André and Édouard Michelin, in order to promote it at the Universal Exposition of that year. To explore further the importance and influence in society of the Bidendum (add to mental paradigms), we note that in 2000, it was chosen as the best logo of the Twentieth Century, by the prestigious newspaper Financial Times and Report On Business magazine. 1 The Encounter of "The Three Wise Men"
In November 1926, in Bolton, Lancashire (England), Henry Thomas, son of a policeman, ran away from home, in the evening, to meet with his friends. They decided to play hide and seek. Henry went into an alley and saw an open door. Believing that one of his friends would be inside the courtyard, he decided to enter. The young man was surprised to see three "people" in the back, watching through a window. They wore strange clothes, like rubber, and shiny silver. The boots were dark. On the head they had a transparent helmet; several tubes were joined to some tanks, on their backs. The three humanoids were of normal stature. They looked like the "Michelin Man", but more slender. The humanoids seemed to detect the child and turned to him. Their heads were pale and resembled a light bulb, with dark eyes, a nose and barely defined mouth. The most curious thing that Henry would say later about his mysterious encounter was that it seemed as if the humanoids were three wise men, despite their terrifying appearance. One of the humanoids emitted a gurgling noise, and all three took notice of the child. The young Thomas fled, racing for home, where he told his parents what happened. This case represents one of the most puzzling encounters where the described humanoids were similar to the popular Bibendum. 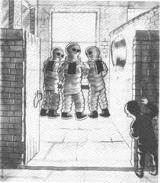 Bolton was an industrial city and perhaps the child had seen advertising somewhere on the "Michelin Man.” Also, this starts a singularity, as discussed below, that occur in many close encounters with anomalous entities of this type in which several of these experiences are not associated with UFOs. On October 16, 1954, near Maubeuge (France) between Avesnes and Louvroil on the RN 2 road, connecting Paris to Brussels, at about 00:00, Monsieur Mozin was returning home in his car. At about 800 meters on a hill, he saw lights. When approaching, to about 100 meters, he saw that it was a cylindrical object, like a rocket, about two meters in diameter with several legs on its bottom. Suddenly the lights went out of his vehicle, but the engine continued running. He approached to within four or five meters of the artifact. It was in a narrow space between the road and the ditch. It had a leg height of about 30 cm, was a white metal with vertical lines every 10 cm in the fuselage. It had a huge opening, and inside was a very intense white light (illuminating the exterior) from which hung thick cables or pipelines, along with a variety of buttons and switches. He also saw a humanoid, approximately 1 meter high, with heavy boots and wearing a helmet that covered his shoulders. 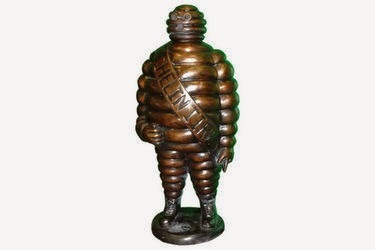 His suit looked like the "Michelin Man.” Its face was not defined, nor its hands, and it moved very slowly, dragging its feet. After monsieur was about 100 meters away, the lights on his automobile came back on. The next day, Mozin, in the company of a friend, discovered the landing zone which was about 1.5 meters, within which were three deep, semicircular scars, forming a triangle, of 8 cm to 10 cm. Iin the center of the triangle was a charred circle about 20 cm in diameter and they detected an odor like benzene. Monsieur. Mozin suffered eight days of sleeplessness and “imagined” that the "Bidendum" appeared at the foot of his bed. In this incident, we see an element that is common in most encounters with the "Michelin Man”: his movements are clumsy and slow. In addition to the detail of the boot. The researchers suggest that monsieur Mozin was able to visualize some days later the figure of Bibendum in his bedroom because of the latent effects of distortion. On May 15, 1955, in Dinan, Côtes d'Armor (France) at about 00:15 pm,a Mr. Droguet (employed at a university), was returning home after seeing a movie.When he opened his back door, he heard a noise, then he saw a ray of green/blue light which hit him in the face. His knees shook and his hair stood on end. He felt a strange vibration. In the courtyard of the university, the witness observed a huge object of about 12 meters in diameter, a saucer-shaped dome, floating about 1.50 meters above the ground. 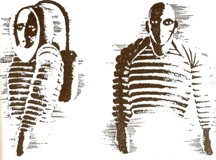 Next to the object, Mr Droguet, saw two beings, about 1.60 meters in height, wearing something "like wetsuits," metallic gray in color, very similar to the Michelin Man. They seemed to have noticed the presence of the witness. Theyboth had on a very thick helmet and gloves, and from their bellies protruded a small black box containing several cables. One of the humanoids seemed to collect "rocks" from the gravel road, while his companion inspected the surroundings. They "approached a window and looked at the boiler room." The witness was very scared but could not move, He was paralyzed with fear. Although whether by fright, or by the action of a light that lit up the mysterious artifact, Mr Droguet said he thought he saw, inside the object, a third crew member who handled a "light projector" that was watching him. Then the two humanoids, moving with difficulty (as if they had weighted feet) entered into the artifact by a central black hole in the bottom, where there was a metal ladder. The witness could hear the metal steps as the beings climbed them. Then he felt something like "an air suction" and the artifact raised vertically, rotating above the trees in complete silence. Monsieur Droquet regained mobility and fled to his home. The experience lasted about fifteen minutes, although the witness it has lasted much longer. Henri Durrant said, in the magazine "Lumiere Dans la Nuit," about the collection of gravel from the road that "the aliens have little common sense, at least they were not really doing geology studies, but [perhaps] research on human urbanism." In this case we see some characteristics already described by the Theory of Distortion in other reports, 1) The use of a recognizable archetype for the action of the crew (the collection of soil samples) and 2) The crew of UFO used "light rays" to immobilize the witness. The ufologist Jean-Michel Ligeron, interviewed a woman, Madeleine Pierrard who, in the early 1950's, had a close encounter with a UFO in Vaux-en Dieulet (France), when she was fourteen. About 6:30 am, accompanied by her father and his dog, she went for the cows in his herd. When suddenly she heard a strange noise like phonemes, Hoo! Hoo! Hoo!. Suddenly she saw a fireball approaching. It landed in front of witnesses and she found that it was shaped like a flying saucer. Her father told her not to move because he feared that they might get burned. The device was translucent (like glass). Inside the object they saw a small humanoid about 1'40 meters in height, with a suit like that of a diver, with arms outstretched. (It seemed he could not move). His appearance reminded them of the Michelin Man. Its head was helmeted, similar to a motorcycle helmet, with a transparent visor (of a material like Plexiglas), with two tubes that were connected to two bottles on its back. The humanoid was motionless, staring at Madeleine but she felt a warm sensation (similar to long exposure in the sun). After two minutes the flying saucer began spinning like a top as it rose up. (They had heard the same noise the beginning.). The object went toward the town of Buzancy. The ground had a burnt area. There is a picture of Bibendum and wearing motorcycle helmets very similar to that described by the witness. It should be noted, that the reader will note that most of the dolls marketed as Bibendum were too rigid, his arms stuck in the body or extended leaving a sense of extreme rigidity. Also note that the humanoids are often observed staring at the witnesses. In May or June 1960, in Jerez, Cadiz (Spain), the teacher Miguel Ceballos Timermans riding his motorcycle between the towns of King's Meadow and Arcos de la Frontera, while climbing a hill, found a giant humanoid on a side of the road. It was about 150 meters away, and seemed to be inflated. The witness stopped his motorcycle. The strange passerby was wearing a red suit, from head to toe, and walked toward the witness. It looked like the "Michelin Man.” It walked slowly like a robot with rigid and articulated movements. It was, at least, two meters high. Mr. Timermans did not see the face of the humanoid. The witness observed that another being came from behindthe first one, with the same features, but much smaller, 1 meter high. Also it differed in that one of his legs had a dark side, in contrast to whole body being lit. Mr. Timermans said that it might have been a boot. The two humanoids crossed the road diagonally, and quickly disappeared from view. Curiously Miguel went to the spot but he could not see anything. The things had simply disappeared. The aspect and detail of the boot, leaves no doubt that the "Michelin Man" was the origin of this distorted experience. Also as indicated by the witness, the humanoids did not continue their walk; they simply disappeared, indicating that the phenomenon had the sole purpose of, being seen by Mr. Timermans. On December 6, 1967, in Haute-Vienne (France), around 6:00 pm, the Pealons, from inside their observed a small humanoid floating about 1.10 meters in the air near the embankment of the road. He had a suit like the Michelin Man, and the head was like a balloon. Before disappearing the humanoid raised his arm twice. A similar case occurred in Saint Nizier in Moucherotte (France) in the summer of 1974. Overnight, J. F. C. Granier and his brother H., were inside their vehicle when they observed a humanoid about 1.60 meters tall, motionless beside the road. His face was completely smooth like a dolls and it was dressed like the Michelin Man. Its arms were very long. The mysterious "being" turned around and disappeared into the undergrowth. Hours later, another witness saw a similar humanoid that disappeared with a big leap. It should be noted that one of the favorite positions of Bibendum, in ads, is “hello” with its arm raised. They had great helmets on that partially hid their face. When they discovered the presence of the witness, the object emitted a blinding flash and a blast of hot air [as it departed]. The witness’s nose bled for eight days after the experience. The gendarmerie investigated the encounter, and the director of fire and rescue departments, Captain Leopoldo Legros, found, in the hat and pants of Mr. Fontaine, traces of above normal radioactivity. At the site of the incident, Mr. Legros found in six points, lined 3 in 3, and abnormal radioactivity. The researcher J. P. Lavilgrand reported that, Captain Legra, within five meters in the place where the UFO stood, eight herb plant stems had 60 mil Roentgen. The measures were not "alarming", but keep in mind the measurementd were made ten days after the incident, and probably rain that affected the area, had lowered the radioactivity. Again we find an incident where the UFO is described as translucent. And also note the interesting detail that the humanoid face is never described clearly. One part led upward and the chair was adhered to the pole. Luis’s humanoid resembled the "Michelin Man," but was more slender. “His feet were like "flog´s legs.” A bubble or bowl was put on Luis head and emitted a fog which became orange. There was silence. Suddenly, another humanoid appeared in the company of Rodolfo. Taking away the "bowl" the young men descended the UFO realizing the time as 10:20 hours. On January 7, 1974, near Warneton (Belgium), near France, at about 20:40 hours, a Belgian businessman was driving down the road when, suddenly, his car lights went off, the engine died and the radio stopped working. the mouth was a simple slit in the face. Their faces looked the same and both suits were in one piece. The "soldier" opened his mouth and the witness felt a discomfort in the neck and heard a modulated sound. Then came another car in the distance and both turned in unison, the humanoids, walking stiffly, like robots, but with agility, without being affected by the mud of the road. They went to the artifact which took off just as the other vehicle was coming. The use by the witness of words related to the military to describe the experience (UFO like an English military helmet, humanoid with clothing like a military uniform, belt with bullets), indicates prior knowledge of the witness (on these particular military issues) that appear "distorted" in the close encounter. 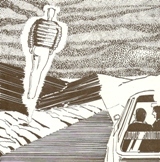 On June 19, 1974, in Cote-d'Or (France), during the night, three men were chatting beside a road, when they observed a luminous object flying very slowly, coming down behind a hill. One witness approached the scene of the alleged landing. There was a white, dome-shaped object, wider than high, with two large, red lights on its surface. With binoculars, the witness observed that there were two burly beings with helmets, in front of the object. They seemed to be wearing a very heavy costume, similar to the Michelin Man. The witness not could see any legs. He then heard shots made by a poacher, and left immediately. Other witnesses corroborate that UFOs were seen before and after the incident. Again we find the testimony of a person who tells us that the humanoid suits were heavy. Arriving in a corn field, following the sound he heard, he observed a metal disc with a dome, like a big car, 2 meters high and 3.5 meters in diameter, and suspended about 45 cm the ground. They had helmets with antennas on each side. The witness pointed out that they moved with agilitydown the ladder and on the ground. The first "entity" on the ground used a long stick with which he scraped the ground. The second humanoid carried a bag. A fourth crew member was inside the disc, and discovering Mr. Severin shot a ray of bright light.The three humanoids returned immediately to the object, which rose after issuing a whistling noise. After observing the UFO, the witness suffered various physical ailments, losing his sight, was speechless, and was about five days in a state similar to semi-coma. (The witness did not know the incident of 1968.) In this case we see perfectly the elements used by the distortion to create the experience, which often mix details supplied by the "“external agent”" with the mental contribution of the witness. Consider the three points that can be found in other experiences and product of "“external agent”": 1) UFO semi-transparent. 2) The use of the archetype of the "sampling". 3) "shooting rays of light" against the witness. On March 14, 1974, Marines, Valencia (Spain), minutes before 22:00, Vicente Corell with his wife, Carmen, stopped his car at a Stop sign to enter another road. At that time, Carmen observed a strange light white/pink oval that disappeared quickly. At 100 or 200 meters, he saw a cloud of dust, rising from the ground. The small "tornado" was 1 meter above the ground, close to the road. It was moving in the same direction as the car of the witnesses. The lights of the vehicle penerated the vortex, showing a figure. It was a very tall humanoid, with arms and legs attached to the body, giving him the appearance of a column.The humanoid wore a very tight one-piece, dark but shiny suit. The arms of the body wre completely stuck and did not move at any time. With the vehicle parked on the side of the road, the humanoid made a turn, touched the ground and was completely at attention (like a soldier). At that moment, the lights of the car turned off. The car began to smoke in the engine area. The humanoid looked toward the witnesses. Vicente, nervous and afraid, left the premises until they ceased to see the mysterious being. Later, they were helped by other vehicles, but none of them had seen the humanoid. When Mrs. Corell, took the car to the shop, the mechanics found that the cable connecting the switch with the left headlight was completely burned. Two details attract your attention at this encounter. The static position of the humanoid is very reminiscent of the Michelin dolls, the company Michelin, marketed in Spain, where Bibedum always appeared with arms close to body. Also this particular detail, could be influenced (distorted) by the witnesses, since returning home after attending the ceremony of swearing-in ceremony of his son, who was in the military service. And Vicente himself who explains that the humanoid behaved in a firm military fashion. On June 30, 1976 west of Colby, Kansas (USA) A young couple, accompanied by their baby of a few months, claims that while driving on I-70,they observed several objects like flying saucers. One disk was about 12 meters high. The object was about 45 meters in diameter. On reaching home found that they had come much later than normal. With the help of hypnosis, the Dedulcas found they were abducted and subjected to medical examination within a UFO. They remembered that three humanoids, with round eyes and helmets, and bodies like the "Michelin Man", communicated with them through telepathy. The crew had a height between 1.50 and 1.60 meters, and they do not recall having seen hands or feet. After the experience, the witnesses found needle marks on their arms, and marks on their ankles like wrist-restraint straps. They also had a "rash" and "scratches" on their backs, which healed quickly. In Belgium, Bibendum he was also very popular. Little is known about an incident that occurred in Incerlik (Turkey), where in the summer of 1991, according to records of the researcher and friend Albert Rosales, a U.S. Army military man observed a humanoid wearing a spiral, metal suit similar to Michelin Man. In this particular incident, we find the only close encounter with this type of entity that ends in a classic episode of abduction and medical examination. It is somewhat shocking that in the many cases noted, except for the strange case of Argentina, the Bibendum, only "abducted" some witnesses. Although the reports produced by researchers in these next three events, do not directly mention the term "Michelin Man" to describe the clothing of the occupants of the UFO, I think they are "distortions" of the famous Bibendum, mixed with the "astronaut" concept. In a late June or July 1972, in Deming, New Mexico (USA), Mrs. Hilda McAfee and her mother, driving in the direction of Las Cruces where, about 23 miles east of Deming, she was surprised to see a blinding ray of light. Amid the strong light, she observed two figures of average height, wearing pale blue overalls. The costume was very large, with wide belts, gloves, and dark boots. On their heads was a case with the dark visor. The humanoids were not concerned by the presence of women. They were "repairing" or "working" under a artifact that emitted a blue light, while talking to each other. They seemed rigid in their movements. Patti Morris, a researcher, said the women believed they had hit the artifact with their vehicle as it was in the middle road. They also speculate that the "light" of the device was used to avoid an accident. The two women had burning, sharp pains in the chest and arms after the encounter on the road. Interestingly, the husband of Mrs. McAfee, Mike Rogers, is the brother of one of the witnesses of the famous Travis Walton case. On June 25, 1974, in St. Cyrille, Quebec (Canada) at the 1:15 hour, Mr. M. L., 29, going to bed, after watching television, heard strange noises outside his trailer, as if something had fallen to the ground, Boom! Boom! From the living room window, he observed a strange, luminous reddish/orange disk floating about 1.20 meters, over a nearby field. In fear, he woke his wife when he heard a "buzz." Looking out the bedroom window, they watched, less than 4'5 feet away, a silhouette like a robot. From the living room window, they saw three humanoids about 1.80 meters tall. On the chest of the robots were red lights in thick, horizontal lines, (like in toasters). The researcher Wido Hoville speaks of infrared light. The lights flashed on and off. The arms appeared to be metallic. Because of this effect of light and the darkness of the night, they could not see the faces of the humanoids. The humanoids moved like robots with articulated movements and floated about 90 cm above the ground. The robots examined an uninhabited trailer in the area, especially the wheel and the shaft. (Would it would be possible that visitors from space, crossing the galaxy, did not know the wheel!). During the experience, which lasted about 3 hours, the couple came to count up to fifteen humanoids. All the robots were placed in a perfect line by a nearby stream. At about 4:20 pm, the luminous disk and the bright creatures were gone. Apparently an anonymous woman called police to report the presence of a UFO and crew. John Roy, a resident of Drummdvillem, found three oval rings of flattened grass at the alleged place of landing. They had a size of 5 meters by 3.30 meters in diameter, with a perimeter of 60 cm of crushed grass. Within the circles, they found three depressions of 1.20 cm. Three months after the incident, the footprints were still visible, and the grass inside the rings had grown 2 times more than normal. Also found were flat pieces of a strange white substance, similar to plastic in the area where they saw the robots. Subsequently, Mr. M. L. learned that a very fierce dog of a neighbor, fled the night of the encounter, taking several days to reappear. On the morning of June 30, 1974, a strong glow woke Mr. M. L. and again, at the window, he watched a flying saucer landing on the site. A neighbor come by in a car, but the artifact was gone. No remains of the landing were found. In these incidents, we see that the distortion is present, not only in the appearance of the humanoids, which, again, move rigidly as robots (detail omnipresent in our study) and their attire reminiscent of Bibendum, but also in the elements that make the whole experience: 1) The pervasive "ray of light" (in both cases); 2) The use of recognizable and assimilated archetypes of “road reapir" (USA case) and a "study of the area" (Canada case). Does such behavior indciate extraterrestrial astronauts, fixing a spaceship in the middle of a road? And is it reasonable that 15 robots, illuminated like Christmas trees, are placed in formation, near a river? On February 10, 1977, in Tucson, Arizona, Ms. Lois Stovall, watched, from the window of her home, a strange luminous object approaching. Accompanied by her grandmother, Mrs. Alice Buckner, she went into the yard to see it better. The capsule-shaped artifact (2 meters high and 70 cm in diameter) with a transparent opening in the front that had dark vertical bars was located near a small tree, less than 15 meters away. Inside the object, they saw a gray humanoid, inflated like a balloon, with stripes on its joints, such as suits of astronauts and the doll-like Michelin Man. They could not see hands or feet. The humanoid was 1.20 cm in height, cramped into a small space, which barely fit, with light coming from his feet. Ms. Buckner, approached the object, but could not touch it because it was higher than she could reach. The humanoid face, behind glass, was barely visible. Suddenly the artifact went up and flew away. Ms. Stovall observed three helicopters, with bright red lights in their cockpits, flying at low altitude, by a nearby school and even flew over the object, apparently, not observing the capsule. The witness observed between five and six helicopters circling the area. Mrs. Dessie Turner also observed the object, with a dark figure inside, and the strange helicopters. Research conducted by APRO could not determine the origin of the mysterious helicopters. This case is very interesting. Again we find a transparent UFO and a humanoid that barely fits in the cockpit. Details of the three helicopters can be an added "distortion" of this type of aircraft, but the puzzling elements, that are added to the whole experience give it an absurd air (oneiric, from our point of view). Most of these close encounters have occurred in France (9) and two in neighboring Belgium (one even close to the frontier), and two in Spain, where Bibendum was very popular, thirteen cases in total, in the areas most influenced by the Bibendum/Michelin Man logo -- France/Belgium/Spain. Therefore, throughout this report we have shown how the phenomenon of distortion works. In addition to using images and information from the unconscious of the witness, the “external agent” provides "components" one should not miss in the final result of the experience. Apart from subjective interpretations of each witness, these factors provided by the “external agent” (rays of light, transparency, breakdowns, sample collections, and trace elements) are intended to provide evidence, that after an apparent "individual mental phenomenon," something more complex is underlying the experience, something hidden behind the fabric of history. This would explain why we find in other close encounters, the same “details” in the background of the stories: paralysis, light rays, landings in the middle of the road, breakdowns, collected samples, et cetera. The same applies to the outer shape of UFOs. Before the distortion caused by the action of the witness, almost all artifacts and "aliens" have a quasi-fixed description: Three landing legs, a metallic look, lights, ladders, et cetera, the rest a result of a creation or the intervention of the psyche (and imagination) of the witness. In our study we found and documented that close encounters with entities like the Bibendum, are represented almost in all aspects, elements, characteristics, and actions that one finds in any kind of UFO experience starring other entities (regardless of their bizarre appearance). It is therefore logical to assume that the external appearance of the incidents (flying saucer and crew) is "flexible and circumstantial" to each witness, and that only in the background do they keep an almost fixed structure. It should be noted the participation of the unconscious influences all the images, which helped to design the look of the Bibendum humanoids, as they also had characteristics of the suits of astronauts of the time, both those used by NASA, or described in the novels, comics and TV, films science fiction, et al. This interaction allows the events to materialize, physically, "mental elements and concepts" from the oneiric-like experiences; that is, this "anomalous manifestation" occurs, contrary to our dreams, in a way that creates an "objective, tangible and independent" reality that challenges our concept and understanding of the “objective reality” that surrounds us.